The immune system is a formidable defense against microbial intruders, identifying and eliminating the threats through an extremely intricate and adaptable network of specialized cells. However, a system of such mind-boggling complexity is also prone to misfire. Due to genetic mutations for example, some of these specialized cells in your immune system might turn rogue: they can no longer differentiate between invaders and your own cells, and thus start attacking healthy tissues. For serious cases, this issue leads to “auto-immune diseases” – such as arthritis, inflammatory bowel disease, type 1 diabetes and many more – which are widespread in the population. Most of the current treatments against auto-immune diseases require to shut down major parts of the immune system, inhibiting desirable immune responses and, leaving the patient vulnerable to potentially life-threatening bacterial and viral infections. Such a drastic solution is required because until now scientists had yet not fully identified a different mechanism in these rogue cells they could use as a selective target – the known genetical material was common between healthy and rogue cells. But in their publication in Nature Communications, researchers in Okinawa, Japan reported a previously undiscovered role for a known molecule - named “JunB” – and its associated gene: JunB seems to be essential for a specific type of white blood cell to turn toxic. From left to right: Hiroki Shirahata, Dr. Shin-ichi Koizumi, Dr. Daiki Sasaki and Prof. Hiroki Ishikawa. 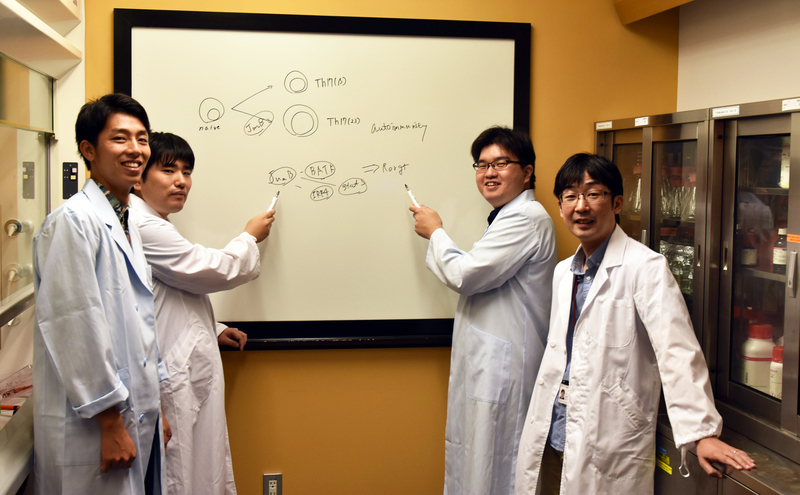 The OIST scientists studied the process in which T-Helper 17 cells become toxic. One of the immune system communication molecules – interleukin 23 - is required to “wake up” T-Helper 17 cells during an infection and make it start fighting the invaders. But interleukin 23 is a double-edged sword: it also responsible for sometimes triggering the same T Helper 17 cell to turn rogue. For T helper 17 cells to hear the wake-up call, they need to display interleukin 23 receptors on their surface, which means the corresponding gene – usually switched off – needs to be activated. Finding a way to stop this interleukin 23 receptor gene from being activated is potentially key to shut down the entire process. And this is where JunB, the focus of this research, comes into play. JunB is a transcription factor, which means it regulates – switches on and/or off - the activity of a gene or a group of genes in the cell’s DNA. OIST researchers from the Immune Signal Unit identified JunB by systematically checking transcription factors in the T Helper 17 cell DNA. For this purpose, they would “knock down” – meaning disrupt the gene DNA sequence – the genes for each transcription factor one by one. For each knocked down gene, they checked if the T Helper 17 cell still display its interleukin-23 receptors. When they knocked down JunB, they realized the T Helper 17 cells were no longer displaying interleukin 23 receptors and were unable to turn rogue. Moreover, mice in which T Helper cells lacked JunB were incapable of developing T Helper 17-related auto-immune diseases. In this direction, OIST researchers went onto investigate the exact role of JunB, and this is where it gets a little complex. As a transcription factor, JunB activates another gene - RORγ-t – by helping three other transcription factors bind to the DNA sequence in the chromosome. The product of this gene RORγ-t is a fifth transcription factor which activates the gene Interleukin-23 receptor. Only then the T Helper 17 cell displays interleukin 23 receptors and might turn rogue. 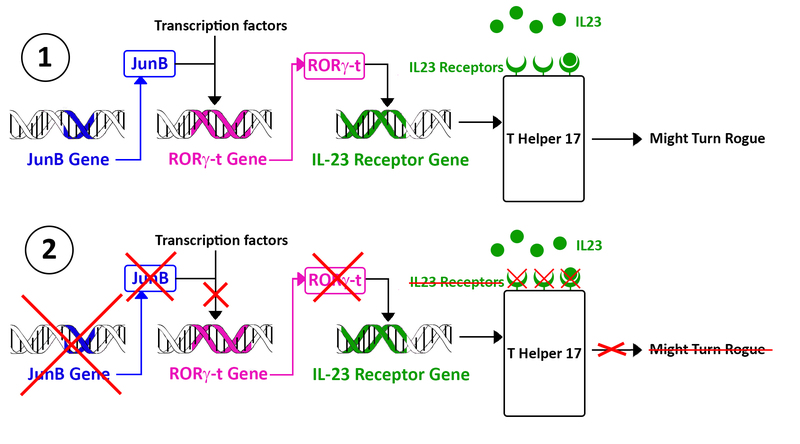 1) The normal process in which JunB can activate the Interleukin 23 (IL23) receptor gene to make the T Helper 17 cell sensitive to Interleukin 23. This potentially lead to the T Helper 17 cell to turn toxic. 2) Knocking down JunB prevents the production of Interleukin-23 receptors, and the T-Helper 17 cell cannot turn rogue any longer, but is still able to fight infections.